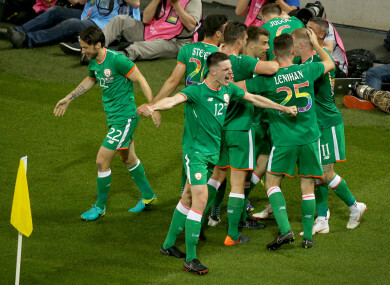 Ireland players celebrate a goal against USA. IRELAND HAVE MOVED up two places to 29th in the latest Fifa rankings. The Boys in Green’s most recent matches were a 2-0 defeat by France at the end of May and a 2-1 win over USA at the beginning of June. Belgium and Brazil have swapped places, with the former now second, while Croatia, Uruguay and England have all made big leaps to go fourth, fifth and sixth respectively. Portugal, Switzerland, Spain and Denmark complete the top 10. Elsewhere, after their disappointing World Cup group stage exit, Germany have suffered a big fall, going from second to 15th. Wales are down one to 19th, Northern Ireland go up two places to 27th and Scotland also move up from 42nd to 40th. You can view the rankings in full here. Email “Ireland rise two places in latest Fifa rankings, Germany fall dramatically”. Feedback on “Ireland rise two places in latest Fifa rankings, Germany fall dramatically”.